Happy Holidays from your Tag Team!! Custom Engraving here at Tag UR It! inc. Here at Tag UR It! inc, we have engraved all sorts of unique items! From flasks, to bullet casings, to fine jewelry, to metal plates for an urn, and everything in between! Through the many sentimental and beautiful pieces we have engraved, we have heard wonderful stories behind many of these engravings. An engraving is a personalization that lasts forever, a way to truly make something uniquely yours. A couple of those engraving stories can be found in our yelp reviews. If we have done some custom engraving for you in our Costa Mesa warehouse, we would love to hear your story too! Be sure to leave a review on our Yelp or Facebook page!! For more information on custom engravings, drop us an email or give us a call for a quote! After working in the private childcare industry for over seven years and now that I’m about to become a mom, I’m always on the lookout for products I couldn’t live without and think are worth their weight in gold – more now than ever. The Child Safety ID Tags are one of those products. As a caregiver and soon-to-be mom, my number one priority is the safety of the kids and that’s why I love that Tag UR It Inc has created such an innovative product. Here are a few reasons why I love them so much. There is no privacy concern. There are many other products on the market, but they show your child’s personal and confidential information to anyone walking by your vehicle. They’re secured to your child’s carseat. No need to worry about whether or not they’re still going to be in their correct place after a crash or whether or not they’ll cause any damage. The Child Safety ID Tags are securely attached with adhesive, so there’s no doubt that they’ll be where they’re supposed to be in a time of need. Another place I always keep one is inside an easily accessible pocket of my diaper bag. Such a great idea if you frequently venture out with children alone, but especially great if you have some sort of medical need that may cause you to lose consciousness. They’re completely customizable and include a photo. You can include anything from parent contact info, to nanny or grandparent info, to allergies. Adding whatever information you feel is important for others to know is important. With all that being said, the ladies at Tag have so graciously allowed me to do a giveaway for you guys! There will TWO winners! Each winner will win one Child Safety ID Tag with a sleeve and strap. Elise is a professional nanny, CPST, soon-t0-be boy mom, and blogger. These days you can find her creating awesome content, eating dairy and gluten free foods, or fighting pregnancy insomnia. You can find her blogging at Naturally West Coast, or stalk her on Facebook, Instagram, or Twitter. Here at Tag UR It! inc., we love getting to know our customers and learning more about the amazing businesses we provide name badges for. This week, Jay’s Catering stopped by our Costa Mesa headquarters to pick up their latest name badge order. They brought us an awesome surprise treat of delicious turkey sandwiches!! We just love our customers who bring yummy treats when stopping by our office! The Tag Team thanks you, Jay’s! What an awesome surprise. We all enjoyed them!!! Jay’s Catering was founded in 1961 and began as a retail and wholesale distributorship. Today, Jay’s employs over 200 people, operates nine exclusive venues, and caters events in some of the most desirable locations throughout Southern California. Jay’s Catering has received many accolades and awards including Orange County Hotlist: Best Caterer for 5 consecutive years, 2010 Lifetime Achievement Award by Catersource Conference, OC Register Best of OC: Best Caterer in Orange County in seven separate years, The Knot Best of Weddings 4 times, and many others! Jay’s employs a boutique-style approach and an unwavering commitment to excellence in order to create a unique once in a lifetime catering experience for each and every client. Through our business relationship over the last couple of years, we know firsthand that everyone we have encountered represents the incredibly kind and attentive team you will work with at Jay’s! Be sure to visit the Jay’s Catering website to learn more and follow them on social media to see photos of the many delectable meals and treats they are producing daily!! The layered style square metal name tag (shown below) is the fun yet sleek and elegant look that Jay’s was going for when working with our graphic art team to design the perfect tag! Does your restaurant, hotel, or business want to make a unique statement? It’s time to think outside the box with custom name badges, designed just for you and your staff! This is a layered style square name tag custom designed for Jay’s Catering who were looking for a bit of a different look! The square shape definitely sets this badge apart from the rest and it came out looking fabulous! 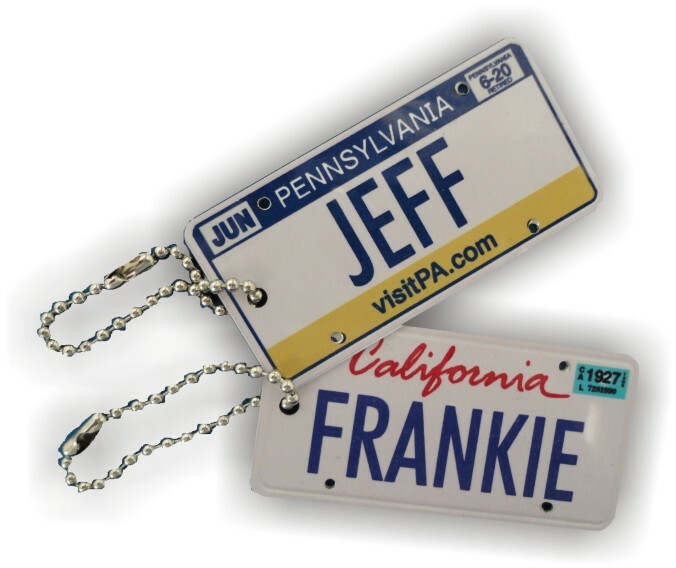 Along with our very large selection of standard name tags, here at Tag UR It! inc. we can work with you to create the perfect name tag for your employees! Our talented graphic design team will help you select shape, material, concept, and design of the name tag you are envisioning. We have no set up fees of minimums here at Tag UR It! inc.! After you have worked with our design team, we will provide you with mock ups so you can see exactly what your name badges will look like before production. We want to make your name badges ordering process as easy as possible! So many graduates this time of year; high school, college, or earning a PhD. Inspire your graduate to reach for the stars as they enter this new chapter in their life! I love quotes! Sometimes a little inspirational reminder is all it takes to turn a bad mood around or keep you going when you’re having a rough day. A few inspirational words, the photo of a loved one, or the thoughts of a wise person in the form of a quote can be that perfect reminder to put smile on your graduate’s face. Here at Tag UR It! inc., we offer many ways to show off what inspires you! We can engrave your favorite quote on plastic or metal to be worn on a necklace, put on a key chain, or used as a sign on your desk. 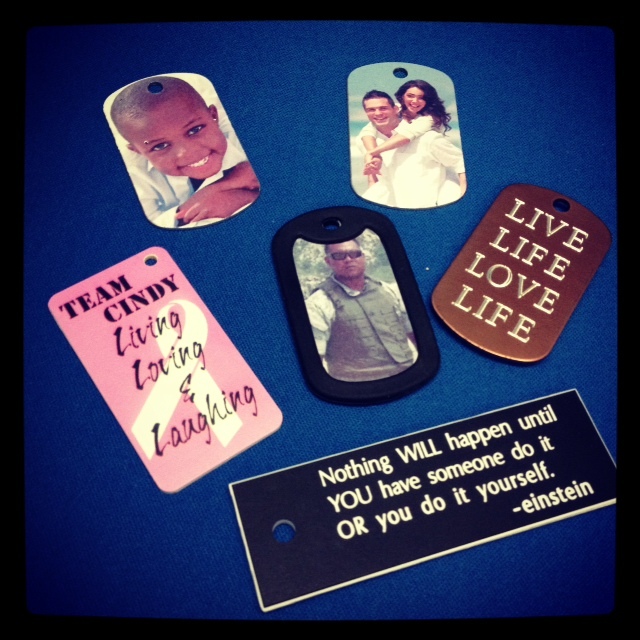 We can sublimate photos or encouraging words on a dog tag to be worn on a chain or used as a key chain. We can custom design a plaque to hang on the wall. The possibilities are endless! Check out our website or contact us to learn about all the options!!! Today is National Volunteer Appreciation Day, the last day of a whole week devoted to thanking and appreciating those who volunteer in their communities and abroad, helping those in need! There are many non-profit organizations nationwide where volunteers gather and organize to go out into their communities, helping where needed. The YMCA is the largest non-profit community service organization in America. According to YMCA-USA, “the Y engages more than 10,000 neighborhoods across the U.S. As the nation’s leading nonprofit committed to helping people and communities to learn, grow and thrive, their contributions are both far-reaching and intimate—from influencing our nation’s culture during times of profound social change to the individual support they provide an adult learning to read.” The amazing help the YMCA provides to communities nationwide would not be possible without the thousands of volunteers that come through YMCAs in every state. Here at Tag UR It! inc., we are very proud to work with many YMCA associations and branches nationwide providing name tags and awards which recognize not only the accomplishments of athletes but also the hard work of many volunteers. Our 1″ x 3″ YMCA name badge, available with any logo color and up to 3 lines of text! For non-profit organizations both large and small, taking the time to recognize the tireless work of the volunteers helping you reach your goals is monumental. There are many ways to let your volunteers know just how much their work means to your organization and the community they are helping. A simple “thank you” can boost the spirits of volunteers and excite them to work harder and push even further. One way organizations recognize their volunteers is through recognition awards, either perpetually displayed in their headquarters or smaller awards given monthly or quarterly to a volunteer who has truly gone above and beyond. Our 4″ x 6″ recognition awards are the perfect smaller individual plaque to award to a distinguished member of your volunteer team. These classic yet classy plaques are available in multiple wood and metal faceplate finishes The wood options include walnut, black, black and rosewood piano finish, and more. The most common faceplates include silver, gold, or white sublimated in full color with photo or logo. Our 4″ x 6″ recognition award, shown here in black with silver faceplate. Another award option is our perpetual plaque. With this option, your organization would have one large plaque displayed in your headquarters. 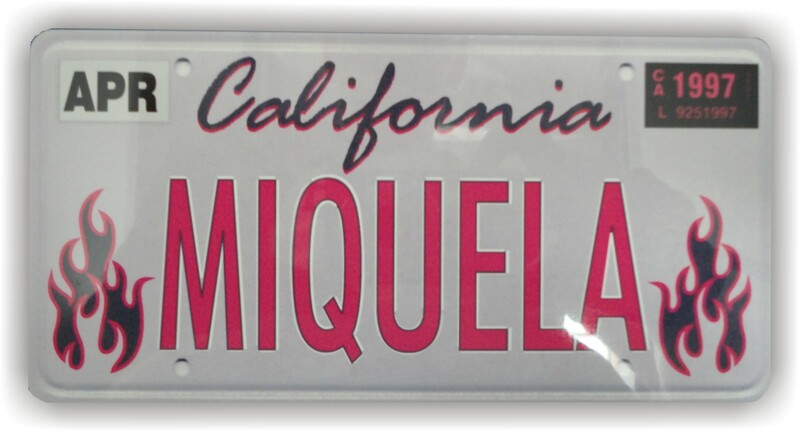 Each month, quarter, or year you would send us the name of the most recent recipient and we would sent you a newly engraved perpetual plate to add to your plaque. Regardless of how you thank you volunteers, take a moment to let them know how appreciated they are today! For more information on any of the products you see here, visit our website or email us today. We hope all organizations, large and small, are able to find the perfect way to say “thank you” to their volunteers today!